Posted on January 30, 2013 by Susan H.
I couldn’t resist baking up a loaf of Dairy, Egg, Soy and Peanut/Tree Nut Free Hearty Irish Soda Bread. A favourite of mine to accompany a hot bowl of soup on a cold and blustery day. The Irish Soda Bread recipe originates from the Canadian Living Step By Step Cookbook…spying this recipe had me craving a slice…now I just needed a bowl of soup! I came across a very simple recipe for Potato Leek Soup over at lucys friendly foods. Click here for the original recipe. I just so happened to have most of the ingredients…a partly used carton of vegetable stock and leeks were already in my refrigerator, however, I switched up the potato with sweet potato. 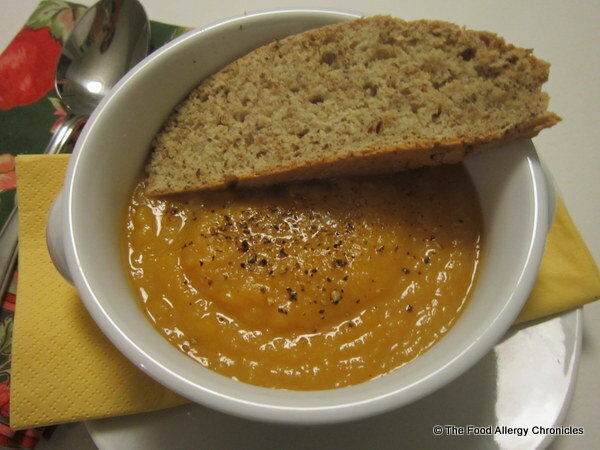 Three simple ingredients = a quick, easy, nutritious soup! With a soup recipe to try…I had the perfect excuse to bake a loaf of Dairy, Egg, Soy and Peanut/Tree Nut Free Hearty Irish Soda Bread! Click here for Canadian Living’s original recipe. Click here for the post I did on a plain version of Dairy, Egg, Soy and Peanut/Tree Nut Free Irish Soda Bread. Buttermilk replacement: 1 1/2 cups of buttermilk with Natur-a Soy Beverage (for a soy free version use Natur-a Rice Beverage) mixed with 1 1/2 tbsp white vinegar. Flour replacement: I used 2 cups of whole wheat flour and 1 cup of unbleached all-purpose flour. Flaxseed replacement: I used and equal amount of flaxmeal and I sprinkled the top with flaxmeal instead of the unbleached all-purpose flour. I encourage you to make sure you really dust with flour the area that you will be kneading the dough, as well as, have a pile of flour at your finger tips to dust the top of the dough in between kneading to reduce the amount of stickiness. 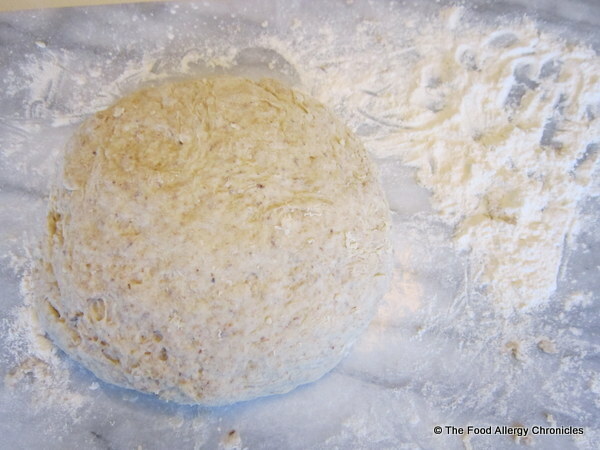 The picture above shows my completed kneading of the dough with the extra flour to the side. 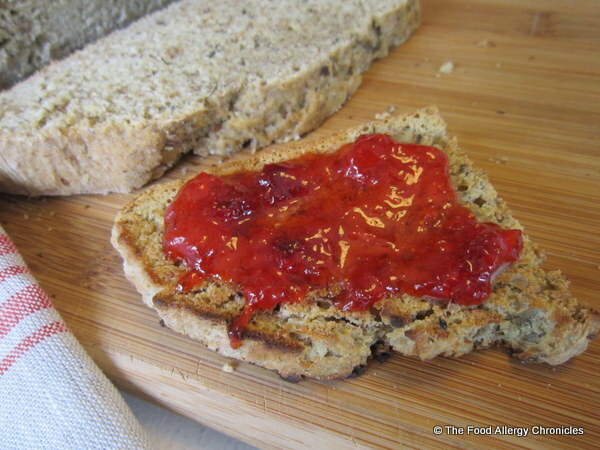 Delicious toasted with jam, honey or a spread of Vegan Becel Margarine. P.S. Posting my favourite winter soup soon. P.P.S. Carla @ My 1/2 Dozen Daily is having another giveaway of one of her beautiful handmade items. Click here to check it out! What is your favourite winter soup…what do you like to accompany it? This entry was posted in allergies, baking, breads, dairy free, dinner, egg free, lunch, multiple food allergies, peanut/tree nut free, soups, soy free, vegetables and tagged Canadian Living Step By Step Cookbook, Carla @ My 1/2 Dozen Daily, Dairy Egg Soy and Peanut/Tree Nut Free Hearty Irish Soda Bread, lucy's friendly foods blog, Natur-a Rice Beverage, Natur-a Soy Beverage, Sweet Potato and Leek Soup, Vegan Becel Margarine by Susan H.. Bookmark the permalink. maybe I’ll see you tonight at Penny and Co if I make it out , we have peanut and tree nut allergies in my home , seeing what your dealing with makes me grateful we only have peanut and tree nut allergies I know it can’t be easy facing such challenges . Cobi is so great , she came to my house for the Steven and Chris show just about two years ago and did a filmed house tour of my beachy house , she was such a nice warm lady, I admire her so much and miss her presence in H&H . Just got back…big turn out, Cobi was impressed! I had a chance to ask her about some tartan wool left over from my wedding…pillows! I love her concept of decorating one’s home with the things you love…my kind of decorating! 🙂 Sorry I missed you.